Phrase that needs to be used more: Edward Cullenization. As in the Edward Cullenization of romantic interests in teen books. As in putting your love interest on a pedestal and seeing nothing wrong with them ever, having this idealized version of them in your head that no one could ever really live up to. As in, I have certainly Edward Cullenized John Green. Because I love him. And he is awesome. Also, I saw both covers and came down in favor of the blue cover. And then there were only yellow covers left! So I bought one with a yellow cover. And THEN the girl ahead of me in line overheard me telling J that I liked the blue cover. And it turned out she liked the yellow cover better but had bought one with a blue cover. So we switched! *Okay, so I have only seen him twice, including this time. 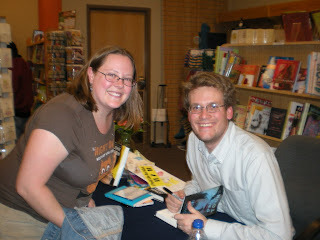 But I wholeheartedly believe that there could never be a time when seeing John Green would not be awesome. So... yeah. I'm so glad the picture turned out AWESOME!! !